So. I went and signed up for NaBloPoMo, even though I did rather badly at it last year. Of course last year was not in any way a normal year, and November was particularly bad, because that was when it became painfully obvious that my mother was actually dying. Under the circumstances, I'm not terribly inclined to beat myself up about whether I posted enough that month. And we will just see how this goes. I'll be surprised if I actually post every day, but stranger things have happened! Added: it took me about 5 minutes to find my copy of Money. The next sticking point: I don't know my own passwords. I have a list but it's at work! 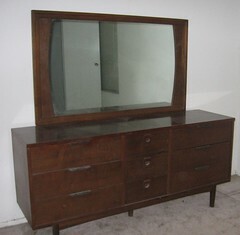 It's a shame we don't live anywhere near each other, or I would have taken that dresser and mirror. We have a vintage buffet from the same time period, and there's something about the slightly weird mix of boxiness and curviness from 1960's furniture that I love. Hmm, shame you can't send your husband down with a truck - he could do some work on my computer while he was here! That is a nice piece. It doesn't fit with my decor (and I'm also far, far away), but if it's at all possible, I think you should hang on to it -- mostly for the sentimental value (I have some beat up Childcraft furniture from the mid-60s that my late mother and I "refinished" (i.e., "badly stained") that I really don't want to part with), but also because it will come back into style, and it is such a classic of the period. I guess I could find room for it if I really wanted to - but I guess I don't, really. Honestly, I think it looks better in that picture than it does in real life! And like I said, it tended to constantly be covered with junk. It depresses me to think of bringing it in here. Oh man, I would love that dresser. It would fit in my house perfectly! How long a drive is it from Gulfport to Galveston? Re: 16 hours? 17 hours? ladyloo76.livejournal.com - 16 hours? 17 hours?